Turin, September 27, 2017 – Comau has been awarded as the “Bronze Winner” at the International Rational Process Achievement Awards 2017 organized by Kepner Tregoe. The prize was obtained for the implementation of the Kepner Tregoe PA (Problem Analysis) Method in the development of a new body assembly framing station, which allowed Comau to enhance its reliability. The station is a modular, highly flexible and expandable system, employed in body-in-white applications. The new framer, developed by Comau, is adaptable to any existing plant and can be used to assemble any type and size car – from small cars to electric vehicles. In addition, it is Industry 4.0 compliant thanks to the ability to transfer work data and status information to the central system, both remotely and in real time. Its launch is scheduled for the last quarter of 2017. The implementation of the new framer project was spearheaded by Comau’s engineering team and began in 2015. The design validation step, which began in the middle of 2016, involved cooperation between the Comau working team and the FCA Reactive Group, the training program regarding problem solving methodologies that was launched at Maserati by Judson Estes in 2013, and was deployed at the FCA EMEA level in 2017 with the coordination of Luca Baciarello. The Body Framer was a pilot project for Comau’s involvement in this training program, in which the KT-PA methodology is taught and applied. The good results achieved during the validation process allowed the engineers to successfully test the plant in an extremely short time, ensuring that all technical parameters required to start the production were reached. This project shows Comau’s commitment to a continuous improvement strategy, characterizing the design and the manufacturing of innovative and cutting-edge industrial automation solutions. 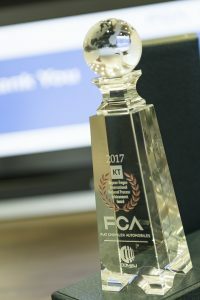 In addition, it demonstrates the Reactive Program (started by the FCA EMEA Quality unit and adopted by the NAFTA Team in 2013) is a key feature for the development of FCA Group’s problem solving skills and their quality know-how. The Kepner Tregoe Bronze Award 2017 was officially delivered to Comau’s team during a ceremony recently held at FCA Group’s plant in Turin. Bill Baldwin, Chief Operating Officer of Kepner Tregoe, Salvo Melchiorre, Comau’s Head of Quality, Aleksey Gaponov, FCA EMEA’s Head of Quality, Marco Bo, Manager of EMEA Quality Planning and Warranty Manager, Luca Baciarello, EMEA Reactive Program Manager & KT Program Leader, Luigi Migliore, ‎Comau’s V.P. Global Solutions Development, Gian Marco Garbellotto, Comau’s Product Engineering & Management Director, and Roger Alessandro Vitrotti, Comau’s Head of Quality Powertrain Machining, attended the award event. Comau, a member of the FCA Group, is a worldwide leader in delivering advanced industrial automation solutions that integrate products, technologies and services to help companies of all sizes increase plant efficiency while lowering operating costs and optimizing returns. Headquartered in Turin, Italy, Comau has over 40 years of factory-proven experience, and an international network of 35 locations, 15 manufacturing plants and 5 innovation centers that span 17 countries and employ more than 9,000 people. With a strong focus on innovation, Comau is committed to developing competency through the formation of individuals and groups as part of its open automation approach. Comau is driving the future of production automation by engineering lean and sustainable solutions and products. Its modular, flexible and highly-configurable products can be tailored to meet the needs of each individual customer. Through the continuous development of products and services, Comau is able to lead the automation industry in every phase of a project – from design, implementation and installation, to production start-up and maintenance services. Its comprehensive offering includes manufacturing and assembly solutions, powertrain machining, robotics and asset maintenance services for a wide range of industrial sectors.